Jack Cavendish needs to get to his station at Fort Charlotte, a fur-trading outpost in Grand Portage, Upper Canada. The fort is only accessible by canoe, and there’s just one man willing to take him on the perilous, thousand-mile journey from Montreal this late in the summer. Young Christian Smith, the son of an Ojibwe mother and absent British father, needs the money to strike out on his own, so he agrees to take Jack deep into the wild. As they travel endless lakes and rivers, at times having to carry the canoe over land, the arduous expedition takes its toll. Yet the attraction between Jack and Christian, two men from vastly different worlds, grows ever stronger. Locked in a battle against the wilderness and elements, how long can they fight their desire for each other? This book is available in e-book and Kindle formats. 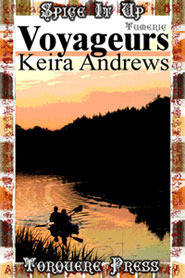 Voyageurs, by Keira Andrews [Torquere Press, 2010], is one of a series called “Spice It Up” wherein each story features a different spice—in this story it is the clever uses of turmeric. Otherwise it is a period story (somewhat historical) set in the year 1793. I make the distinction because, apart from a few historical references—i.e. Upper Canada, the North West Company and the existence of Voyageurs, also coureur des bois—there is very little actual history that one can point to. I hasten to add, however, that the author does a very fine job of capturing the ruggedness experienced by adventurers of the time. It is also a very credible depiction of romance and love between two manly men in a primeval, wilderness setting. Journalistically speaking the writing is very strong, and the plot is well thought out and progresses at a nice pace. It also unfolds logically so that the reader is never left to wonder how an element came about, or where a certain character came from. And speaking of characters, although they are understandably few in this story, the twoo protagonist are well-developed and credible. Jack’s evolution from a pampered Englishman to competent outdoorsman is believable, and Christian’s transformation from a resentful half-breed to accepting lover is equally credible. What I would have liked to see, however, is more historical authenticity. For example, reference is made to “Grand Portage” being hypothetically located in Upper Canada, and the large lake they encounter suggests Lake Superior. This implies that they were heading north/west from Montreal, but what route did they take? For Canadian readers, especially, this sort of inclusion would have greatly added to the story. Once again I hasten to add that these are only minor quibbles that do not seriously detract from the romantic element of the story. Four stars.